This article is about the scientific discipline of computer graphics. For other uses, see Computer graphics (disambiguation). A modern rendering of the Utah teapot, an iconic model in 3D computer graphics created by Martin Newell in 1975. Computer graphics studies the manipulation of visual and geometric information using computational techniques. It focuses on the mathematical and computational foundations of image generation and processing rather than purely aesthetic issues. Computer graphics is often differentiated from the field of visualization, although the two fields have many similarities. One of the first displays of computer animation was Futureworld (1976), which included an animation of a human face and hand—produced by Ed Catmull and Fred Parke at the University of Utah. Swedish inventor Håkan Lans applied for the first patent on color graphics in 1979. There are several international conferences and journals where the most significant results in computer graphics are published. Among them are the SIGGRAPH and Eurographics conferences and the Association for Computing Machinery (ACM) Transactions on Graphics journal. The joint Eurographics and ACM SIGGRAPH symposium series features the major venues for the more specialized sub-fields: Symposium on Geometry Processing, Symposium on Rendering, and Symposium on Computer Animation. As in the rest of computer science, conference publications in computer graphics are generally more significant than journal publications (and subsequently have lower acceptance rates). Topology:studies the behaviour of spaces and surfaces. Successive approximations of a surface computed using quadric error metrics. Implicit surface modeling – an older subfield which examines the use of algebraic surfaces, constructive solid geometry, etc., for surface representation. Digital geometry processing – surface reconstruction, simplification, fairing, mesh repair, parameterization, remeshing, mesh generation, surface compression, and surface editing all fall under this heading. Discrete differential geometry – a nascent field which defines geometric quantities for the discrete surfaces used in computer graphics. Point-based graphics – a recent field which focuses on points as the fundamental representation of surfaces. Out-of-core mesh processing – another recent field which focuses on mesh datasets that do not fit in main memory. 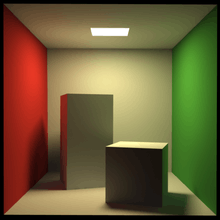 Indirect diffuse scattering simulated using path tracing and irradiance caching. ↑ "geometryprocessing.org". geometryprocessing.org. Retrieved 2014-05-01. ↑ Archived March 14, 2007, at the Wayback Machine. ↑ "Best Practices Memo". Cra.org. Retrieved 2014-05-01. ↑ "Choosing a venue: conference or journal?". People.csail.mit.edu. Retrieved 2014-05-01. ↑ "Graphics/vision publications acceptance rates statistics". Vrlab.epfl.ch. Retrieved 2014-05-01. ↑ An extensive history of computer graphics can be found at this page Archived April 5, 2007, at the Wayback Machine..
↑ "Point Based Graphics 2007 - PBG07". Graphics.ethz.ch. Retrieved 2014-05-01. ↑ "Ron Fedkiw". Graphics.stanford.edu. Retrieved 2014-05-01. ↑ Archived February 14, 2007, at the Wayback Machine. ↑ "Digital Geometry Processing". Cs.ubc.ca. Retrieved 2014-05-01. ↑ "Discrete Differential Geometry". Ddg.cs.columbia.edu. Retrieved 2014-05-01. Foley et al. Computer Graphics: Principles and Practice. Shirley. Fundamentals of Computer Graphics.